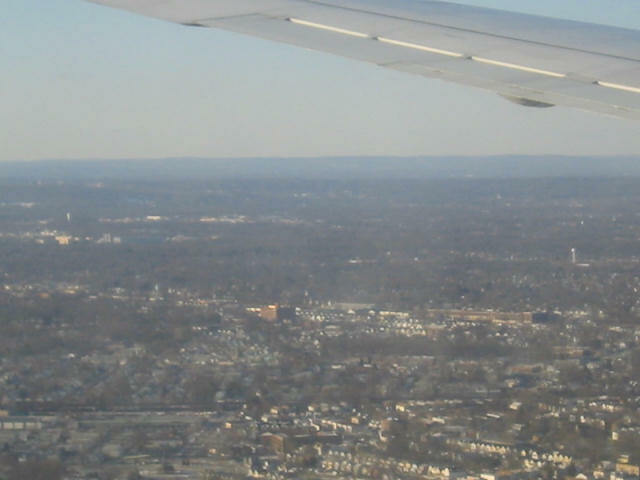 Here is an aerial photo of the Union, New Jersey area looking west from a Continental Boeing 737 landing at Newark Liberty airport on 2004/12/27. The Union World’s Tallest Watersphere, now painted nearly-white, is on the right beneath the wing. The Kenilworth tower is on the left on a small hillock. 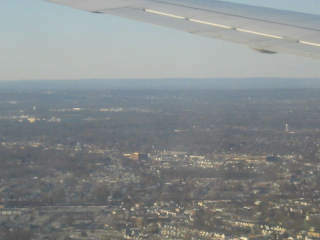 On the western horizon are the Watchung mountains of New Jersey. Click on the photo to get a larger image. This entry was posted on Thursday, October 20th, 2005 at 4:39 pm	and is filed under Experiences, Photos. You can follow any responses to this entry through the RSS 2.0 feed. Both comments and pings are currently closed.